Where to go in Arica? 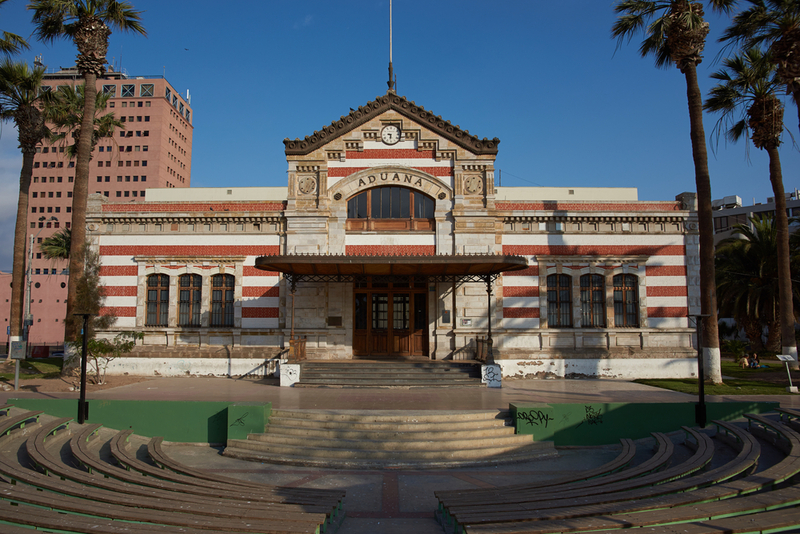 The Casa de la Cultura de Arica, an important arts and cultural center, is housed in the old Customs house, which was declared a National Monument in 1977. It was built in 1874, surviving the tidal wave of 1877. From the second floor terraces, which can be reached by a spiral staircase, you will have a fine view of the Morro de Arica. Another interesting feature of this building is that it was prefabricated in the workshops of Gustave Eiffel et Cie in Paris, and shipped to Chile to be assembled here. In front of this building, in the Parque Aduana (Customs Park), a German-built locomotive can be seen, vintage 1924, which was used on the Arica-La Paz line. The Edificio Estación (Station Building) was constructed in 1913 and it is located beside the Old Customs House was also declared a National Monument. Construction of the cathedral began in 1871, and was completed in 1875. It is in the neo-classical style and stands on a terrace facing the Pacific Ocean. It was built by Gustave Eiffel, like the Old Customs House, and assembled in Arica. Its foundations were laid on those of the Iglesia Matriz, destroyed by an earthquake in 1868. Inside this National Monument is kept an image of Christ dating back to the 12th Century. This National Monument is located on the sea front and is 190 m high. It can be seen from any point in Arica, and from the top there is a view over the whole city, the beaches and the Pacific Ocean. There is a small square where weapons such as cannons are exhibited, and you can also find the Weapons and History Museum. This much-frequented resort offers various places of entertainment for the tourist, including restaurants, pubs and other attractions for a day at the beach, such as the hire of beach buggies, and a gigantic water-slide. The beach is 1.7 km long, with a promenade from which you can appreciate the natural beauties of the Chilean coastline. The water is smooth, with a clean sand bottom, and you can hire a water-scooter or practice a variety of other water sports, such as a body-surfing. It was a guano deposit island near the Morro de Arica, separated from the continent until 1967 when it was linked to the mainland. Traces of pre-Hispanic people were found here. Later, an attempt was made to build fortifications, but these were swept away by the tidal wave of 1868. The cannons used in this failed project were placed on the Morro of Arica. It was declared a National Monument in 1985 and there is now a Historical and Nautical Museum. Years ago this house was the Peruvian Consulate in Arica. It was restored in 1994 and again in 1996. Today it is used as a venue for cultural and artistic activities. The casino is located downtown near the main National Monuments of the city, the Old Customs and Station Building, at the corner of General Velásquez and Juan Noé. It has gaming rooms, gambling machines, restaurants, a bar, dancing area , and shows are also available. For information about upcoming events, check out their website (only in spanish). The Costanera Norte is a walkway which passes along the whole southern shoreline of the city. It begins in the Morro of Arica, and passes through the Alacrán Island, the Yatch Club , and other places, to finish at the beaches El Laucho, La Lisera and Playa Brava. This handicrafts center is located on the road to the Azapa valley between the Manuel Castillo Ivaceta and Adolfo Arenas Córdoba roundabouts, and is a replica of the village of Parinacota. Woolen goods, pottery, carved stones, ocarinas and other objects made by the local people can be purchased here. The town was built by municipal decree on November 28 1979, with the idea of bringing together all handicraft activity, providing workshops for the sculptors and creating an attractive and interesting place for the tourists.